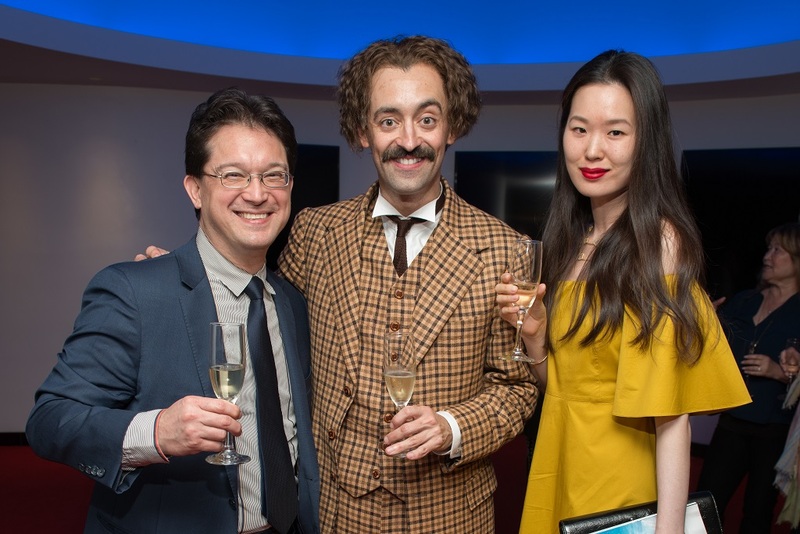 It was an evening to remember as nearly 250 guests gathered at the Alley Theatre to celebrate the Opening Night of Picasso at the Lapin Agile written by acclaimed comedian and film star Steve Martin, whose credits include films Planes, Trains & Automobiles, Three Amigos ,and Father of the Bride. Guests who joined the celebration included director Sanford Robbins, Interim Artistic Director James Black, show sponsors Mike Loya and Ken and Mady Kades, Patty Hubbard, and the cast of the upcoming Neuhaus show The Cake, as well as its director Jackson Gay. The elegant seated dinner, catered by City Kitchen, highlighted a French-inspired spring menu featuring Poached Chicken Breast in Tarragon Aioli mixed with spring peas, radishes, celery, and capers, Ratatouille and Grilled Courgettes, along with an Artichoke, Spinach, and Chevre Tart topped off with their always delightful desserts, which for this evening was a Tart Tatin with Crème Chantilly. Alley Theatre Managing Director Dean Gladden welcomed guests to Opening Night, which included special guests from the Foundations that support the Theatre. Dean expressed his gratitude for their support and acknowledged the incredible work that the Alley’s outreach efforts have accomplished, reaching over 70,000 students every year, and their recent successful wrap-up of a three week residency with Mexico’s Gorguz Teatro and Misa Fronteriza. Board President Butch Mach also thanked everyone for their support this season and especially of the recent record-breaking Alley Ball on April 28. Returning Director Sanford Robbins (November, You Can’t Take It With You) emphasized how “it is a privilege to be a part of the Alley.” He also expressed his appreciation for the generosity of spirit and guidance from Interim Artistic Director James Black. Associate Director of Design Kevin Rigdon, who both Sanford and Dean praised as one of the most outstanding designers in the nation and has been working with the Alley for over twenty years, shared how working at the Theatre is both “a gift and a joy.” Steve Martin was a “wild and crazy guy,” he said as a throwback to one of Martin’s character from his former days on "Saturday Night Live," and he hoped guests would enjoy this “wild and crazy play." Following the play, guests gathered for a special champagne toast led by Gladden in the Mitchell Neuhaus Lobby, where everyone mingled with the entire cast, including Dylan Godwin (Albert Einstein), Joseph Castillo-Midyett (Pablo Picasso), Shawn Hamilton, Torrey Hanson, Elizabeth Bunch, Melissa Pritchett, and Todd Waite, Chris Hutchison, and Jay Sullivan.